On Saturday, a few ladies and I hosted a baby shower in my home for a dear friend, who's expecting her first baby (a sweet girl!) in April! The shower was a lot of fun and very sentimental. Both grandmothers-to-be sent me photographs and baby trinkets from the new parents' infancy. I'm a sucker for sentimental touches like that! The party colors were gray, light turquoise and pink..and, you already know the mantel got in on the party action! Lucky for those looking for Springtime mantel-spiration, this would make a lovely Easter or Spring mantel. Well, minus the baby name banner and vintage baby shoes, of course. Tissue paper flowers are sort of my go-to for easy, inexpensive party decor. And, the tissue paper wreath is a very affordable way to add a little ummmph on a budget. The various sized paper flowers are simply hot-glued to a Dollar Tree wreath form. Easy as can be! The cake pop party favors were made by one of the shower co-hosts (goodness knows a cake pop of mine never looked that good!). The dresses, shoes and ceramic "bloomer" flower pot all belonged to the mom-to-be. Her mother mailed them to me and they quickly became the inspiration for the party decor. The menu was of the brunch variety, which is my favorite kind of menu. The mini-cinis looked extra-pretty in the floral cupcake wrappers and the parfaits were extra-special served from mason jars. I have to say that I didn't cook a single thing for this shower. And, I loved that. All the thanks for the yummy food go to my co-hosts! Remember the no-sew table runner I showed you last week at my daughter's birthday party?? Well, I decided to make another version for this party..but, this time I actually sewed it. What?? I know! My high school home ec teacher would be so proud. 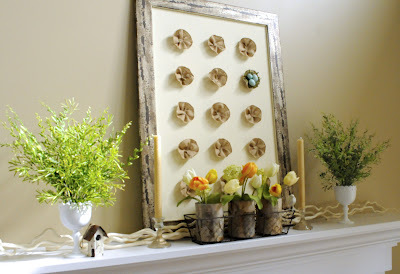 A lovely and creative Spring Mantel from Life On Walnut Street, including a tutorial for the DIY wall art!! 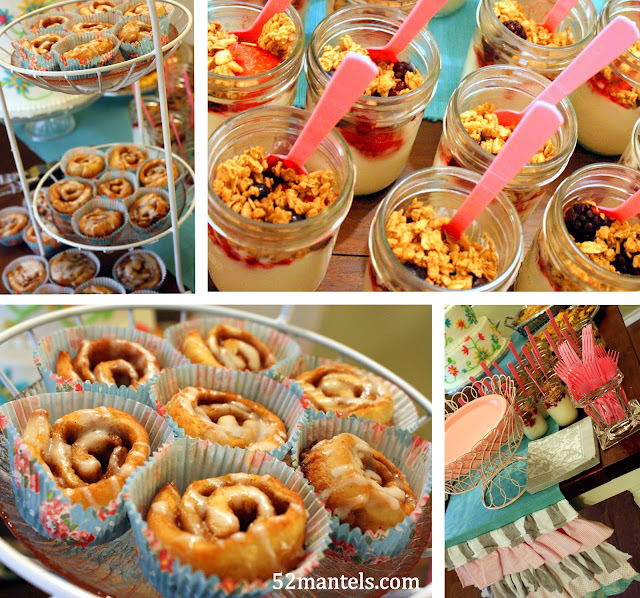 What a beautiful baby shower! Love the color choices and all the tissue paper flowers. Oh my gosh, what a wonderful shower. LOVE the sentimental touches. Thanks so much for visiting me yesterday via the blog hop. I am a new follower. Stopping by from the Power Bloggers Tribe to say hi! New linky tools follower too! What a wonderful baby shower!!! 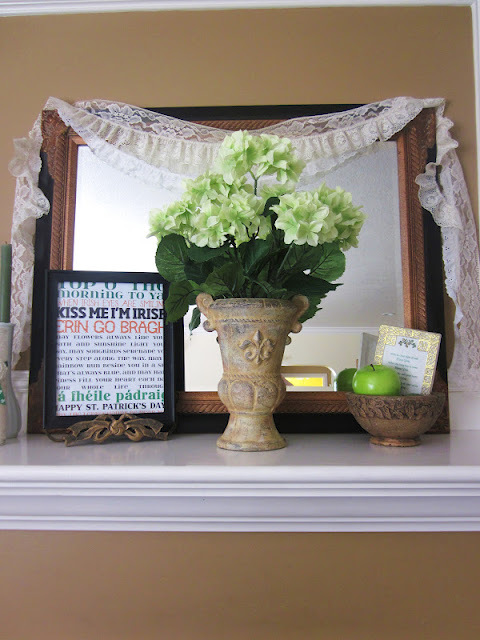 LOVE the mantel of course! Linking up this week can't wait! Love the baby shower mantel ... very creative! The baby shower mantel... so beautiful and cute! We don't have this tradition here but it seems like a lot of fun! that is so happy and pretty! i love all the colors! stopping over from "the tribe!" Your mantel is so pretty and the colors are perfect! I love the features you showed! 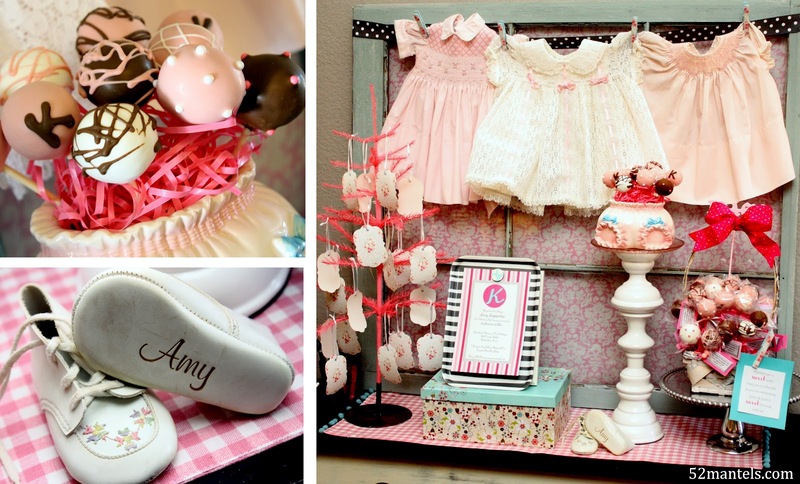 Fabulous baby shower theme mantel! LOVE the fun colors! OHMYGOSH! LOOOOOVE this! I'm such a freak for pom pom's lol.. Is that bad? I love you're blog.. and the whole theme. I just bought a silhouette machine but haven't used it yet.. maybe I can get some cute ideas from you to motivate me! Happy to be your newest follower! ahhhh...love a good baby shower!! adorable! love the runner!! thank you for sharing with us at Uncommon! Love all the work you put into the shower...the colors are perfect!!! Found you over at DIY Dreamer. Lifetime Replacement is an element that you rarely find, while you buy facebook reviews ratings Merely a handful of great suppliers provide this.